$5 Billion: estimated amount of money (dark and FEC transparent) spent by all federal candidates in 2014 election. 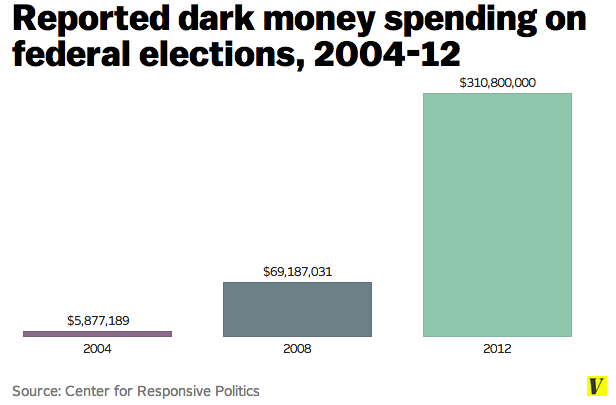 $200 Million: estimated amount of dark money spent in 2014 midterm election. Money not covered by federal disclosure rules meant to inform the public of who is paying to influence their vote. 1904: During the 1904 campaign, New York Life Insurance secretly gave $48,000 ($1.25 million today) to the Republicans (Teddy Roosevelt). Answer: The more you spend, the more you win. During the 2014 midterm election cycle, $92.8 million total was spent on five Senate races in five states. Republican leaning groups outspent Democrats. Was it worth it? You be the judge. In all these close races: Republican Senate candidates won. The highest dark-money spender: Crossroads GPS, an ally of the Republican Party, dumped $14 million into "toss up" races in October alone to total $24 million in expenditures.